Here is a wonderful reference book about everything cat. 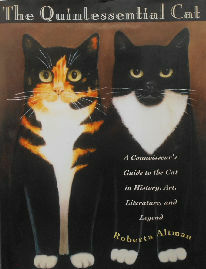 Authors, artists, cat breeds, stories, proverbs, quotations, cat museums and much more. The entries are arrange alphabetically A to Z. Detailed Bibliography, index of authors and index of artists included. Hardback, 7 1/2" wide x 9 1/2" high, 289 pages, black and white and colored illustrations and photos throughout. Copyright 1994. Previously owned but in good condition. Note: This book weighs almost 2 pounds.